What is the real reason why the Vesica Piscis possesses sacred geometry? It is not because it is an ancient Christian icon due to its resemblance to the ichthys (actually, the use of this shape predates the early Christian era when Christians took it over in the late second century as a token of their religion). Any object that is merely a symbol of a religion cannot for that reason alone be given the status of sacred geometry. Rather, the Vesica Piscis is sacred because of its potential to generate both the outer and the inner forms of the Tree of Life (see third image below). It may seem ironic that a Christian icon is so deeply connected to the geometrical object that is central to the Jewish mystical tradition — the Etz ha-Chayim ( עץ החיים). But true, religious esotericism, freed from historical chance and misinterpretation, knows no man-made, theological boundaries. There is but one truth, however differently religions may package it. (See also #12 in Sacred geometry/Tree of Life). 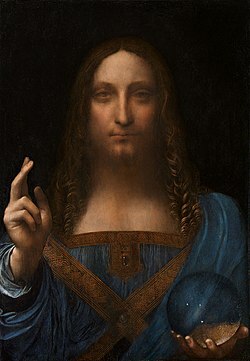 "Salvator Mundi," Leonardo da Vinci's recently restored portrait of Jesus Christ, c. 1490-1519. 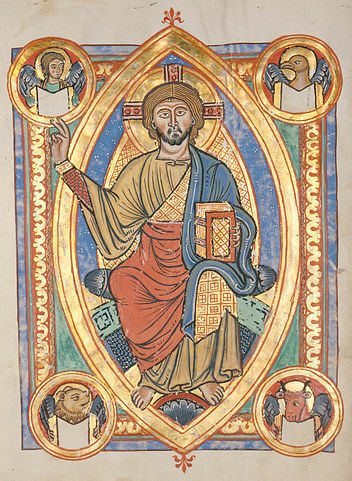 A mandoria of “Christ in Majesty.” (From a Romanesque illuminated manuscript Gospel Book, c. 1220). Christ in his cosmic aspect was sometimes depicted as surrounded by a spiritual radiance, or aureola, with the shape of the Vesica Piscis, although the ichthys (from the Greek word for "fish") was its more likely artistic inspiration. The four creatures within circles are the Chaioth ha Qadesh (Holy Living Creatures), the Order of Angels assigned to Kether at the apex of the Kabbalistic Tree of Life. The generation by 5 Vesica Piscis of the inner form of the Kabbalistic Tree of Life representing Adam Kadmon, or "Heavenly Man." 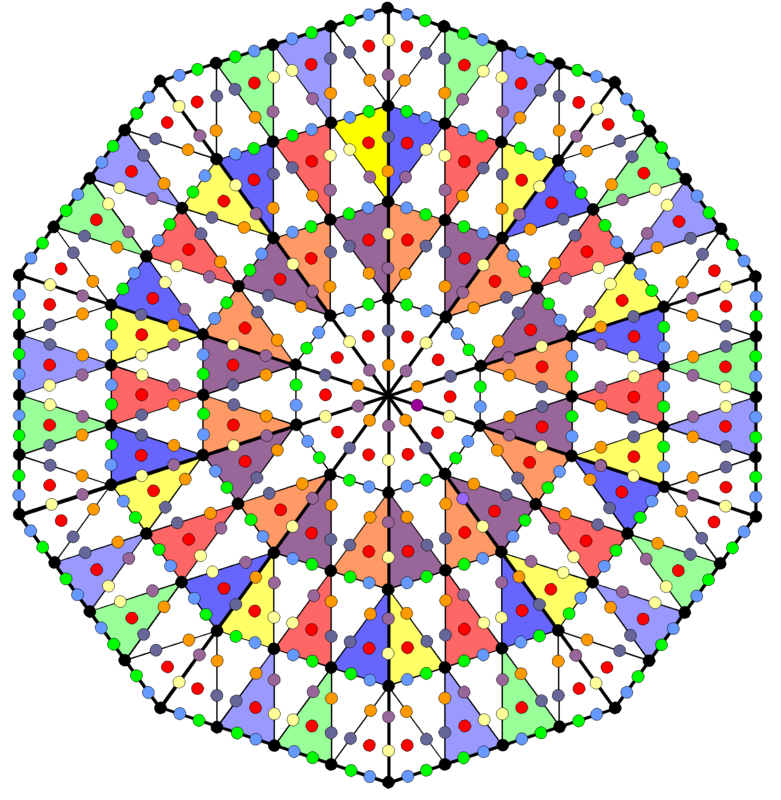 Pairs of coloured, dashed, straight lines that pass through 18 white dots on the boundaries of these Vesica Piscis at the ends of horizontal and vertical diameters intersect at the 70 corners of (7+7) enfolded, regular polygons. In the order of their generation: violet = triangle, indigo = square, blue = pentagon, green = hexagon, yellow = octagon, orange = decagon, and red = dodecagon. 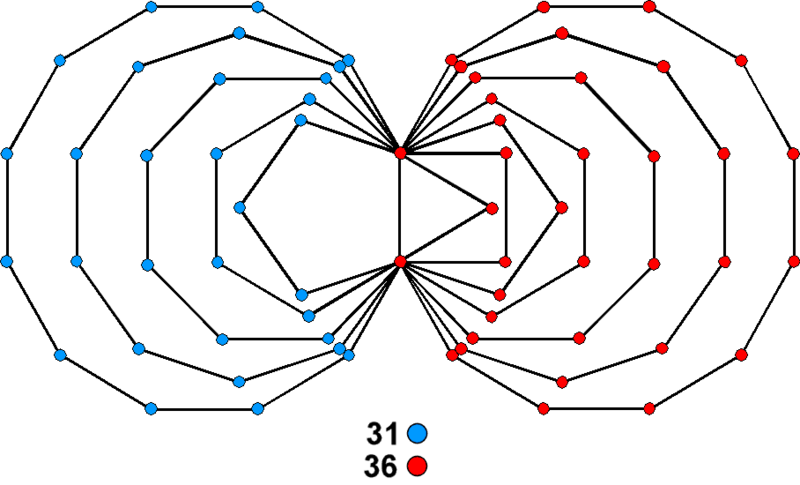 The two dashed lines passing through every two pairs of white dots are mirror images of each other because corresponding white dots on either side of the central root edge shared by the two sets of seven enfolded polygons are mirror images of each other. 1, 2, 3 & 4 are the Pythagorean integers symbolised by the 1, 2, 3 & 4 dots that form the four rows of a tetractys; they add up to 10. The number 1234 can be represented as a tetractys made up of 10 raised to the first four powers of 10, starting with 0. The phrase "knowledge* of God the Creator**" has the very number of SLS in CTOL as the sum of the gematria number values of its constituent words Daath and YAHWEH ELOHIM. All knowledge of God's Creation springs from the root edge as the information embodied in the inner form of the Tree of Life, its endpoints being located at Daath and Tiphareth (or, rather, their projections onto the plane containing the (7+7) enfolded polygons). 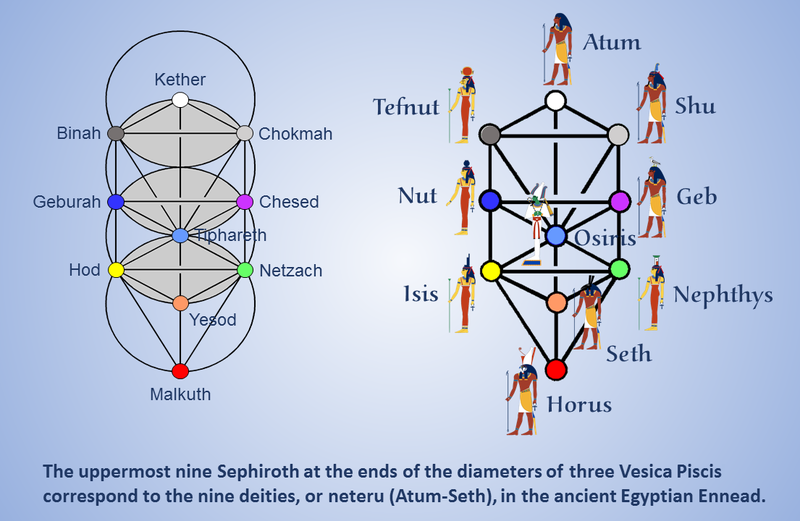 The third Vesica Piscis therefore spans four Sephiroth whose Godname numbers add up to the yod population of the decagon constructed from 2nd-order tetractyses. Having 10 corners, this polygon is the symbol of the Decad, as expressed by the 1st-order tetractys. The number 721 can therefore be said to have a very Pythagorean character! The sum of the number values of the names of these four Sephiroth = 1081 + 148 + 15 + 80 = 1324. Once again, the Pythagorean integers 1, 2, 3 & 4 appear in the sum of the number values of four Sephiroth at the extremities of a Vesica Piscis. * The word 'Daath' means knowledge. "The Holy One, Blessed be He, said to those, You want to know my name? I am called according to my actions. When I judge the creatures I am Elohim, and when I have mercy with My world, I am named YHVH" (Ex R. 3:6). This is consistent with the Pillar of Mercy in the Tree of Life being headed by Chokmah, whose Godname is YAHWEH, and with the Pillar of Judgement being headed by Binah, whose Godname is ELOHIM. In terms of Jewish Kabbalah, it is clear that the attribution by the Order of the Golden Dawn of YAHWEH ELOHIM to Binah is wrong. This Godname is that of Tiphareth, not Binah.